The NHS Music Department would like to invite you to our two Spring Concerts! The Spring Bands Concert, featuring our Wind Ensemble and Symphonic Band, will be on Tuesday, April 24th at 7pm, and the Spring Choral and Jazz Concert, featuring the NHS Chorus, Jazz Workshop and Jazz Ensemble, will be on Thursday, May 3rd at 7pm. Both performances are free of charge, open to the public and in the NHS Auditorium. Our young musicians have worked incredibly hard this year, and the degree to which they’ve evolved and improved as musicians is pretty remarkable. If you’ve been to performances earlier this year, we hope you’ll come out and see how they’ve grown. If you haven’t been to a performance, we hope you’ll make this season your first, and we know you’ll be impressed by our students! In addition to great music, you’ll get to see one of our great traditions–talking a bit about our graduating seniors, what they’ve accomplished, what they’ve meant to us as a program and what they’ll be going on to do after they leave NHS. The Norwell High School Music Department invites you to its two Winter Concerts, on Thursday, 12/8 and 12/15, at 7pm in the NHS Auditorium! As always, admission is free of charge and open to the public. Thursday, December 8 (7pm): Winter Bands Concert, with the NHS Wind Ensemble and Symphonic Band. Thursday, December 15 (7pm): Fall Choral and Jazz Concert, with the NHS Chorus, Jazz Workshop and Jazz Ensemble. On December 8, the Wind Ensemble and Symphonic Band will be performing a range of works, from orchestral arrangements of music by Antonin Dvorak and Sir Edward Elgar, to wind band originals by Robert Sheldon and Jared Spears, the famous Ukrainian Bell Carol of Mykola Leontovych and a wonderful take on the music of Gilbert and Sullivan. On December 15, the Chorus and Jazz Ensembles will be taking the stage. The Chorus will be performing a broad range of repertoire, from holiday favorites to Quebecois folk songs and Broadway show tunes. The Jazz Ensembles will be performing everything from samba and swing to funk and shuffle, including pieces from Jazz at Lincoln Center’s “Essentially Ellington” library, and a vocal feature with NHS Jazz newcomer Katy Mahar. For the first time, the Norwell High School Music Department would like to invite you to *both* of its annual Fall Concerts! The founding of the NHS Wind Ensemble means that NHS now has five large performing groups, and as a result, the school has split its traditional Fall Concert into two separate, shorter performances! Both performances feature a host of talented, hardworking and passionate high school students. Both performances take place in the NHS Auditorium, and both performances are free of charge and open to the public. However, they feature very different performing groups and repertoire. The Bands Concert will feature NHS’ new and advanced Wind Ensemble, performing works by Holst, Boysen and Goedicke. It also features the revamped NHS Symphonic Band, performing works by Tchaikovsky, Zdechlik and Teichler. NHS is also excited to welcome for this performance internationally renowned guest trumpet artist Christopher O’Hara, whose playing has been described by the Chicago Music Examiner as “virtuosic and impressive in every way,” who will be performing works for trumpet and band with both ensembles. The Choral and Jazz Concert is a week later, and will feature the NHS Chorus, our mixed vocal ensemble, under the direction of Amy Cortright, as well as the NHS Jazz Ensemble, the NHS Jazz Combo, and the NHS Jazz Workshop, our developmental group, for an evening of exciting vocal and instrumental music. 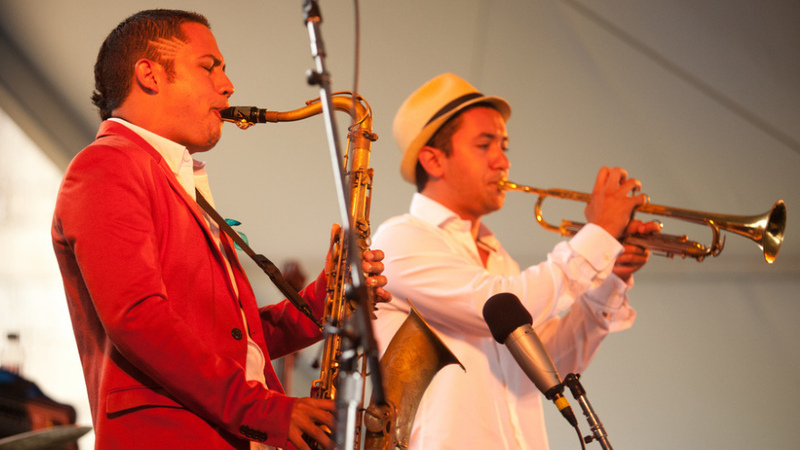 Already well-traveled NHS Music and Berklee alum David Neves performed last week at the 57th annual Newport Jazz Festival, with the Mario Castro Quintet. Newport has hosted nearly all of the most famous names in jazz over the last half century, while launching the careers of countless others. Enjoy the performance, courtesy of NPR Music! Charlie, over at Marimbalogy.com, has put up his first video in a while, this one specializing in how to develop marimba mallet control when using the 4-mallet Stevens Grip. Lots of great tips and exercises for the developing mallet percussionist! There has been a whole host of research done over the decades that has found that the creative processes inherent in arts education are beneficial to the human brain and help people grow in wonderful and sometimes unexpected ways. With the growth of MRI technology, scientists (notably Oliver Sacks’ studies on listening to music and brain activity) have been able to get a close look at specifically what areas of the brain are affected by engagement with music. Charles Limb, at Johns Hopkins (and the NIH), recently presented a talk at TED regarding what happens in your brain when you improvise. He and his team have been looking specifically at jazz musicians and rappers, to measure the differences in brain activity between when you prepare a creative activity (memorize a piece of music or verse and then perform it) versus when you spontaneously generate your creative material (improvisation in jazz, freestyle in rap). The results obviously bring up a lot of further questions, but they’re fascinating all the same. I’ve long believed in the benefits of musical improvisation on students, which is a major reason why we spend so much time doing it in our jazz classes–and while the students enjoy it a great deal, I’m sure they’d be surprised at how much it impacts their brains!